Busworld Kortrijk marks the global unveiling of the Volvo 7900 Electric, it is the first mass-produced Volvo city bus powered exclusively by electricity. Claimed to be "quiet and emission free", the model is around 80 per cent more energy-efficient than a conventional diesel bus. The batteries are charged through the energy generated during engine braking, as well as at bus stops via the power grid. A battery charge via the power grid takes less than 6 minutes, corresponding to around 10 km of driving. The 7900 is available in a length of 12 m.
The launch means Volvo now boasts a comprehensive range of electrified buses. The Volvo 7900 Electric joins stablemates the Volvo 7900 Hybrid (also available as an articulated bus) and the Volvo 7900 Electric Hybrid. In total, Volvo has sold in excess of 2,200 electrified buses since the introduction of its hybrid models in 2010. One of the stars of the show is the new FDD2 Futura double-decker launched by VDL Bus & Coach. Available in lengths of 13m and 14m the vehicle has a capacity of up to 96 passengers. VDL claim that the Euro 6 DAF powertrain and ZF AS Tronic gearbox combined with the aerodynamic styling guarantees extremely low fuel consumption. This 3-axle coach is equipped with a lift for wheelchair passengers above the rear axle. The Futura FMD2-129/370 has a length of 12.9 metres, seating for 59+1+1 and is fitted with an MX-11 271 engine. The distinctive design and height of four metres has made it a real eye-catcher at the show. Solaris showed the new zero-emission Urbino 12 electric and the new Urbino 12 LE. Having had its world premiere at IAA Commercial Vehicles exhibition in Hanover in 2014, the new generation of Solaris city buses have already found buyers in many European countries and have been very well received by operators and customers. The New Solaris Urbino 12 electric is emission-free and clean, it is fitted with the 3rd generation ZF AVE 130 electric drive with axle-mounted motors. This concept frees up space for passengers and significantly reduces the weight of the vehicle. the back of the bus, deliver 240 kWh. They can be topped up via a pantograph installed on the roof. Also a traditional plug-in connection has been provided. Three battery-powered new Urbino's have already been ordered by üstra Hannover City Transport. The Solaris Urbino 12 LE above, is the new diesel powered 12-metre low-entry bus and one of the latest additions to the Solaris intercity buses range. Thanks to the new bodyframe, the 12 LE is significantly lighter than its predecessor, yet the bus’s passenger capacity has been increased. The vehicle shown at the exhibition was fitted with a Euro 6 Cummins ISB6.7 engine which meets the most strict fuel emission standards. Because the exterior of the new range has been aligned, operators will be able to use many identical components and spare parts for different models of the Urbino, including the low-entry version. 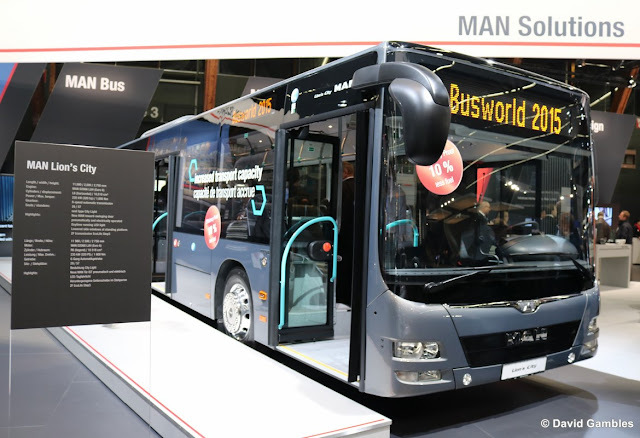 The MAN Lion’s City (below) sets a new benchmark in terms of comfort, safety, economy and sustainability, with innovations such as an optimised air-conditioning system, environmentally-friendly drive technologies, ESP as standard, and segmented side walls. With the newly redesigned middle front panel, the MAN Lion’s City now matches the other vehicles in the MAN vehicle range. It seemed very strange to see a red liveried London double deck bus in the midst of the exhibition. But there is was, on the BYD stand ready to take its place in the ComfortDelgro owned Metroline fleet. This all electric double deck bus is one of five which will enter service this month, the first double deck fully electric powered vehicles in Europe. As illustrated they will operate out of Willesden Garage on the 24-hour route 98 from Willesden to Holborn. BYD have already supplied two single deck vehicles to London which appear to have worked well and now the game gets tough with the advent of full size double deck vehicles taking to the road. BYD have also agreed a partnership with Alexander Dennis whereby 51 BYD single deck chassis and components will be bodied by ADL. More pictures from Busworld Kortrijk will follow in due course, the exhibition is open until 20th October.